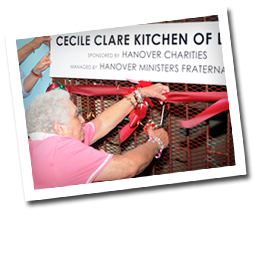 The newly renovated Hanover Charities soup kitchen in Lucea has re-opened and is now called The Cecile Clare Kitchen of Love. The Renovation cost JAS1.5 Million Dollars and the funds were made available entirely through donations raised at the 2011 Annual Sugar Cane Ball. The work includes an extension, making the area much lighter, welcoming and is now 500 square, a new roof, tiled floors, new chairs, tables and utensils. Working with Food for the Poor, who donate goods, Hanover Charities funds 90% of the running of the Soup Kitchen with an annual donation of JAS$1.4 million dollars. Currently the kitchen feeds between 500-700 people every Tuesday. However, with the new renovation the Hanover Charities Committee and the Hanover Ministers Fraternal, lead by the Chairman Reverend Clarke, who runs the Soup Kitchen, they are hoping to open it twice a week. Food is also taken into the surrounding communities to feed the sick, homeless and elderly in the area who cannot make it to the kitchen. Along with the Rev’s Crossman, Allan and Clarke and other ministers who organize the running of the kitchen, there are 10 dedicated and tireless volunteers, who leveling prepare the meal – Merle Thompson, Ardis Morris, Iris Johnson, Jasmine Chambers, Daisy Crooks, Paulette Phillips, Erica Henderson, Grace Smart, Ida Bucknor and Hanover Charities Board Member, Dorothy Harker. Katrin Casserly, chair of Hanover Charities says: “The newly named Kitchen of Love is named after Cecile Clare, a founding and very active member of Hanover Charities and a force behind the kitchen itself. Ms Clare suffered a stoke 3 years ago and we the board members of Hanover Charities felt it fitting to re-name the kitchen after someone who had been so inspiring over the years with her contribution to charity”. 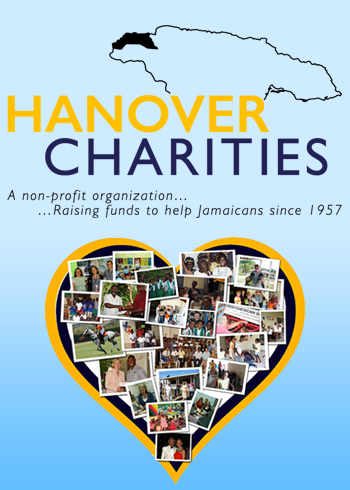 Hanover Charities is now the largest charitable organization in Western Jamaica and in the past 10 years alone has raised over USD$1.4 million dollars. The proceeds mainly come from the annual Sugar Cane Ball held at Round Hill Hotel every February. The Sugar Cane Ball is now celebrating its 55th Anniversary. The theme this year is Shipwrecked with the dress code calling for Pirate Attire and will be held on Saturday 18. Tickets for the event and the fabulous Raffle Tickets (which include a USD$5000 spending spree at Ralph Lauren) are available at Round Hill Hotel. This year’s fundraising festivities also start on Wednesday, February 15, Round Hill Hotel at 6:30 p.m. with an Art Exhibit and sale of work by Louis Ryan, who has had shows in London and Geneva. However, his works for this event are specifically Jamaican inspired and relevant to the Sugar Cane Ball as his wife comes from Hanover and he was married in the Seaford Town Church. 30% of sales from the Art Show go to Hanover Charities.